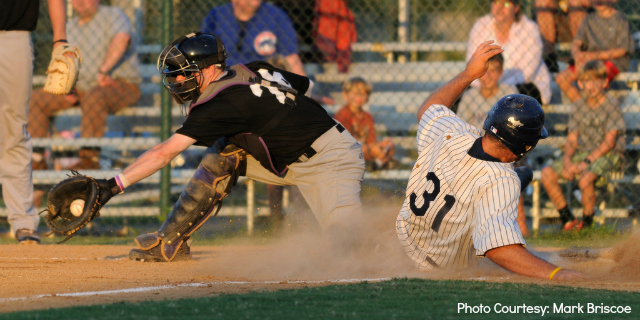 Big Train Have Fun in Alexandria; CRCBL Playoff Seeding, Scheduling, & Ticket Info! After falling behind 2-0 through five innings, the Big Train pushed across a run in the sixth as Tucker Tobin (George Mason) scored on a wild pitch. However, the Aces scored four runs in the bottom half of the inning. Despite eight Big Train players recording a hit in the game, Bethesda was ultimately unable to overcome the five-run deficit, and lost 6-1. The game meant some valued rest time for some Big Train regulars and allowed others to get some fun in before the playoffs start. Big Train outfielders Logan Farrar (VCU) and Kevin Tatum (Cornell) played second and third bases respectively. Big Train relief pitcher Will Resnik (High Point) got in on the fun as well by showing off his bat with a single out of the designated hitter slot. Since a pitcher was hitting, a hitter had to pitch. So Tim Yandel (Tulane) came in to face the last Alexandria batter and promptly struck him out. Without the benefit of minimum requirements, Yandel's 0.00 ERA and Resnik's .333 batting average lead the Big Train. Those stats will be a fine memory as the regular season comes to a close and the postseason begins. 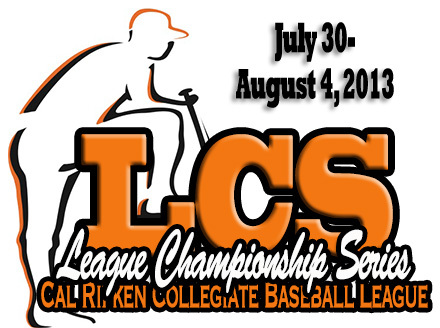 To make sure that you are up to date with the schedule for the CRCBL Playoffs, visit www.CalRipkenLeague.org and www.BigTrain.org frequently. The Giants will host the Redbirds at 5:00 and the Express will host the Orioles at 7:00 today. Both games will be single elimination. After the winners of today's games are decided, the teams will be reseeded and the Big Train will host the lowest remaining team while the Aces will host the higher seed. Both of those games will take place Wednesday night. On Thursday, the winners of the two Wednesday games will play each other while the losers will match up as well. Both games will be played at the higher seeded team. By virtue of the Big Train's #1 seed, this guarantees aThursday night home game as well. Tickets to both games can be purchased here or at the gate. Are these "special" waters worth the money? Editor's Note from Lee Euler: This is a fascinating article about drinking water that deals with many questions I've wondered about for years. One of the big ones is about those expensive machines that alkalinize your water. Do they do you any good? Our guest columnist Frederic Patenaude tackles the question. Keep reading for his answer to that, and much more. . .
For most people, wrinkles... forgetfulness... low energy... sleep trouble... and an onslaught of health problems are the normal part of aging. But one Beverly Hills millionaire proved they don't have to be! At 65 years of age, "Mister B" is at the peak of health. He's bursting with energy... never gets sick... has normal blood pressure, cholesterol and blood sugar levels... boasts a laser-sharp memory... and looks decades younger than his chronological age. Mr. Patenaude's article below also discusses whether mineral supplements are as effective as mineral-rich foods, and whether drinking distilled water leaches minerals out of your body and wrecks your health. Do I need "living" water? "Can minerals in water actually be assimilated by the human body or are they better assimilated when they come from food sources?" It’s much better to obtain minerals from our food instead of from our water. But that doesn’t mean that minerals from water won’t be absorbed by the body. It just won’t be a very effective way and most will be lost. That’s why so many supplements are a waste of time. I heard many times from raw-food circles that only minerals in plants can be assimilated by the human body. Rock minerals or minerals in water are not assimilable. In some Natural Hygiene books, minerals from plants are called "organic" minerals and those from rocks are called "non-organic". In your body, iron is surrounded by the heme molecule. Many of the trace minerals in your body have some sort of protein molecule attached to them. This prevents the mineral ion from reacting with the alkaline chemicals your body produces. In many cases these protein molecules effectively surround these metal ions. It helps with better absorption because some of these molecules can easily attach themselves to the intestine. This doesn’t mean that a non-organic mineral is useless. It just means that once ingested, it has to "compete" with the chemicals that the body produces for proper absorption, with other mineral ions, and bind with protein molecules to attach to the intestine to be absorbed. Can you explain why the pH of water is not of concern to human health? Can you comment on companies selling machines to make "alkaline water"? What they don’t realize is that even in nature, the pH of water will vary from one type of water to the next. PH of pure water is always 7.0, i.e it is neutral, neither acidic nor alkaline. Urine is the only body fluid that can have its acidity changed by food or supplements.The rest of the body pH cannot be changed by anything you eat or drink. It is an established medical phenomenon and it is observed in about 40% of people taking placebo medication in drug trials. So the machine may be good to wash your fruits and vegetables in. While it is not beneficial to drink it is also not harmful but I think there are better things to spend money on. "Can you comment on water ionizers and their alleged health benefits?" There are no reported health benefits to water ionizers. I think the main attraction is the free radical scavenging properties and the fact that they have been effective against bacteria and viruses in washing fruits and vegetables. But when ingested, the body will "seek" to bring ionized water to the pH it needs for its own purposes. So it won’t alkalize the body or the blood. "I heard that drinking distilled water can leach minerals from your body. Is this true?" "Many health fanatics, however, are often surprised to hear me say that drinking distilled water on a regular, daily basis is potentially dangerous. "Paavo Airola wrote about the dangers of distilled water in the 1970s when it first became a fad with the health food crowd... Distilled water is free of dissolved minerals and, because of this, has the special property of being able to actively absorb toxic substances from the body and eliminate them. "Studies validate the benefits of drinking distilled water when one is seeking to cleanse or detoxify the system for short periods of time (a few weeks at a time). "Fasting using distilled water can be dangerous because of the rapid loss of electrolytes (sodium, potassium, chloride) and trace minerals like magnesium, deficiencies of which can cause heart beat irregularities and high blood pressure. Cooking foods in distilled water pulls the minerals out of them and lowers their nutrient value." At this point, I will agree with the conclusion that distilled water is not the best kind of water to drink, but will also point out that a lot of what Dr. Mercola said in his article (which you can find at: http://www.mercola.com/article/water/distilled_water.htm) is almost certainly mistaken. So calcium in your bones, the biggest mineral store, will be used. In one article on Dr. Mercola’s website, it was claimed that: "There is a correlation between the consumption of soft water (distilled water is extremely soft) and the incidence of cardiovascular disease. Cells, tissues and organs do not like to be dipped in acid and will do anything to buffer this acidity including the removal of minerals from the skeleton and the manufacture of bicarbonate in the blood." Distilled water is neither acidic nor alkaline! What happens is that the body removes minerals from various parts of the body to use the minerals it needs for biological function. "Those who supplement their distilled water intake with trace minerals are not as deficient but still not as adequately nourished in minerals as their non-distilled water drinking counterparts even after several years of mineral supplementation. The ideal water for the human body should be slightly alkaline and this requires the presence of minerals like calcium and magnesium"
I guess he is correct that the presence of the minerals will make the water slightly alkaline but drawing the conclusion of alkaline "good" and acidic "bad" is hardly scientific! Bubba Derby (San Diego State) made sure that the Big Train got their wish. He got the start for the Big Train and pitched a seven-inning shutout. 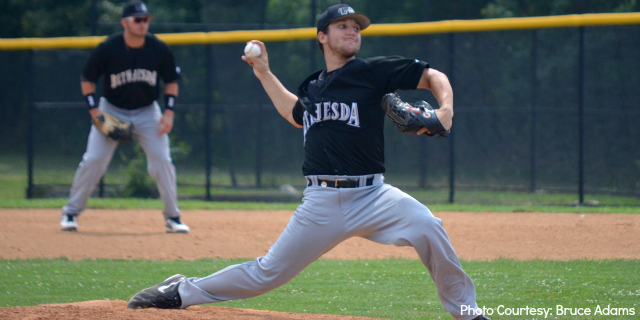 Derby gave up just two hits and two walks in the outing while striking out eight batters. With one out in the top of the first inning, the Big Train got their first run of the game. With one out, Kevin Tatum (Cornell), Ty France (San Diego State) and Johnny Cole (Coastal Carolina) all reached base with Tucker Tobin(George Mason) coming to the plate. After falling behind in a 1-2 count, Tobin worked three straight balls to earn a bases-loaded walk and score Tatum, making it 1-0 Bethesda. Three innings later, the Big Train added another run. After leading off the top of the fourth with a walk, Tim Yandel (Tulane) scored on an error to extend the Big Train lead to 2-0. The 2-0 lead would stand, and the Big Train clinched the pennant, a first-round bye in the playoffs, and the first overall seed in the CRCBL Playoffs. 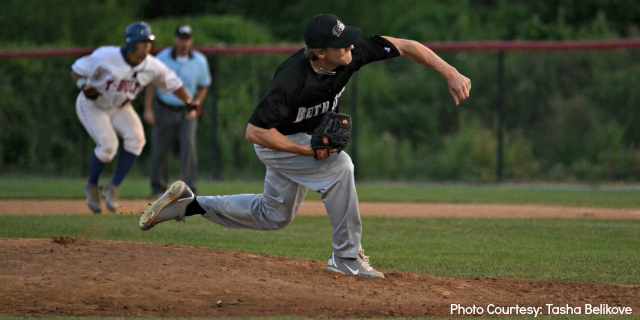 Derby pitched his league-leading third complete game and is leading the league in all three statistics in the pitching triple crown: wins (6), earned run average (0.76), and strikeouts (56). Brock Larson (San Francisco) got the start for the Big Train, and gave up just one earned run over 6.2 innings. But despite giving up just three hits and a walk, Larson would ultimately take the loss. Kevin Tatum (Cornell) and Johnny Cole (Coastal Carolina) both recorded two-hit games, but the Big Train would not push across a run, as Matt Denny threw a complete-game shutout for the Cardinals. The one unearned run in the seventh would be enough for the Cardinals, as they took the 1-0 victory. The Big Train will try for the regular season title once again on Saturday, as they take on the Youse's Orioles at Backman Park. A win for the Big Train clinches the title and a first-round bye in the playoffs, however, the Big Train could also clinch the bye with a loss by the Alexandria Aces. Bubba Derby(San Diego State) projects to start for the Big Train, and will look to build on his last outing in which he gave up no earned runs on just three hits over eight innings. After Saturday's game against the Orioles, the Big Train return to Povich Fieldon Sunday for the Fan Appreciation Night doubleheader against the Alexandria Aces. In honor of our great fans, everyone will receive a Big Train fan to help keep them cool. Tickets can be purchased here or at the gate. A Bowie State University undergraduate with dreams of becoming an immigration lawyer will travel to her childhood home of Nigeria in the fall to study the Yoruba language, as a recipient of the highly competitive Boren Scholarship. This summer, Sodipo is enrolled in eight weeks of Yoruba classes at the University of Florida to prepare for international study. In Nigeria, she will immerse herself in the culture by living with a host family and studying the language at the University of Ibadan in the western part of the country. Yoruba is spoken by more than 28 million native speakers worldwide. Here's something that will make you want to take your coffee black: sucralose might cause cancer. You probably know sucralose under the brand name Splenda, widely available in those little yellow packets. It's marketed under other names as well, so if you don't know what's in your artificial sweetener, you should check (I recommend avoiding ALL of them). The risk was uncovered by an Italian laboratory that found the sweetener caused leukemia in mice. I'll tell you a why a risk exists in the first place for this popular sweetener. But — what's most important -- there are plenty of healthy, non-disease-causing sweeteners out there, as long as you know where to look. Discover your options below. . . Most people choose Splenda/sucralose because they've been told it's healthier than sugar. It prompts neither blood sugar nor insulin spikes. The FDA blessed its use as a tabletop sweetener in 1998, and most of the public still believes the FDA. In 1999, it was approved as a general-purpose sweetener. And it's better than sweeteners like aspartame, saccharin, and acesulfame potassium (found in candies and gum , it's also known as Ace K and marketed as Sunett and Sweet One). Sucralose is a chemically-altered form of sugar. The process is patented, but essentially comes down to inserting chlorine into the sugar molecule. That makes it a chlorocarbon. Unfortunately, chlorocarbons have long been known to cause organ, genetic, and reproductive damage. Sucralose is also known to shrink the thymus gland by up to 40 percent. Given that the thymus is the foundation of your immune system, shrinkage can lead to many other problems. To put it bluntly, any creature that eats chlorine risks cancer. It's a known carcinogen as stated in both the Merck Manual and the OSHA Hazardous Waste Handbook. Obviously the risk varies according to the amount you take and how often you take it, but no matter how you look at it, chlorine is still a toxin. That's why the Center for Science in the Public Interest (CSPI) recently downgraded sucralose to a "caution" rating, as opposed to listing it as safe to consume. The CSPI has reviewed the Italian study and finds it used a superior protocol, even though the study is yet to be published. According to CSPI senior scientist Lisa Lefferts, "That's why we put 'caution' instead of 'avoid.'" A "caution" label means "try to avoid it, we need more testing." Defenders of sucralose might argue that chlorine embedded in a larger molecule differs from unbound chlorine. But the new studies suggest sucralose is toxic, too. Of course, sugar itself is still a risky beast in the health world, and the daily mass quantities consumed are the main reason for our shockingly high rates of obesity and Type II Diabetes, in my opinion and that of many other researchers. I would love to be wrong — nobody's more fond of cake and pie than I am — but this substance is a killer. What can you drink instead? The CSPI urges plain water (know as "still" water), sparkling water, or unsweetened ice tea. Works for me (just don't drink so much tea you disturb your sleep patterns.) The average American consumes an incredible 22 teaspoons of sugar a day, which adds up to 355 calories. If you're on a kick of avoiding GMO foods, be aware that half the white table sugar made in the U.S. is beet sugar made from genetically modified beets. In a moment I'll suggest some natural (or mostly natural) sugar substitutes. But first let me pitch you on giving up sugar completely. It CAN be done, and this may actually be easier than trying to cut back or use substitutes. You see, sugar is an addictive substance. It is the heroin of foods. Thus when you cut back, what happens is that a mere taste of it sets off all the pleasure centers in your brain and you end up going on a binge. You may start with the intention of having a bowl of ice cream but you end up eating the whole quart. For this reason it's actually easier not to touch it at all rather than wrestle with yourself day and night about whether a little bit will be okay, or whether you can do it "just this once." Don't try to make a decision every day about sugar. Make one big decision and stick to it. I weaned myself off soft drinks a long time ago, and I take my coffee and tea without sugar. Soft drinks now disgust me. I once spat out a mouthful of Hawaiian Punch, a drink I used to love as a child. I couldn't believe how sweet it was — utterly saturated with sugar. And believe it or not, coffee and tea taste excellent without sugar. For the first time in your life, you'll actually taste the beverage, not the sugar. Agave nectar: This is a tiny improvement over cane or beet sugar. Also known as agave syrup, this sweetener comes from the agave plant, a relative of the cactus commonly found in Mexico. Agave nectar can also be extracted from the blue agave, which is the same plant used to make tequila. The syrup is 25 percent sweeter than sugar, which is a pro because you end up using less of it. It also dissolves quickly and contains a prebiotic that nourishes intestinal bacteria. But I wouldn't call it healthy. It has the same amount of calories as table sugar—that's 16 per teaspoon. On the processing scale, agave has to be hydrolyzed down to fructose. That's one more step than honey and one less than high-fructose corn syrup. Stevia: This sweetener comes from the leaves of the South American shrub Stevia rebaudiana. It's between 25 and 30 times sweeter than sugar and has been used for years in Europe, Japan, and South America. Yet stevia isn't as natural as most people want to believe. The stuff is highly processed to remove its natural and slightly bitter aftertaste that smacks of licorice, though some brands don't bother with this, so the slight licorice taste remains. It also gets blended with maltodextrin so it pours like table sugar. 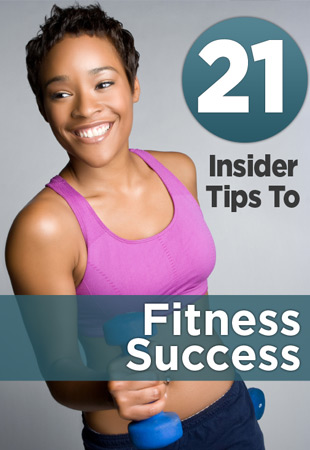 It does help you cut calories and avoid blood sugar problems. It's just a question of whether you can stand the taste. Truvia: This one comes from rebiana, which is a compound found in the leaves of stevia. Truvia is trademarked as a "natural" sweetener, but is the brainchild of Coca-Cola and Cargill and is sweetened with erythritol. It doesn't pack any calories, but also doesn't taste much like stevia. Honey: It's a kitchen staple, yet most people don't think of using it when they're looking for a sweetener. But honey packs a concentrated dose of antioxidants. If you buy honey local to your area, it can even help you fight seasonal allergies. Setting aside the nutrients and just considering honey as a sweetener, I doubt if it's much healthier than cane or beet sugar. It still packs calories and raises your blood sugar. Blackstrap molasses: Molasses is a by-product of sugarcane processing and can be used to replace as much as half the sugar in any recipe. It's also a proven way to sweeten everything from coffee to beans. Plus, this black-gold liquid has iron, vitamin B6, magnesium, calcium, and several antioxidants—more than any other natural sweetener. Again — better than table sugar but not what I'd call healthy. I think a good rule of thumb is to never eat anything artificial. Real food doesn't have to be tested for unheard-of risks. And while sugar should be consumed in moderation just like everything else, at least consider using these alternatives so you can ingest somewhat fewer calories while you curb your chemical, processed food exposure. The Big Train traveled to Blair Stadium on Wednesday night, as they looked to turn things around against the Silver Spring-Takoma Thunderbolts. Trailing 4-0, the Big Train climbed back into the game in the top of the fourth, scoring three runs. A two-run double by Josh Spano (High Point) would scoreTy France (San Diego State) and Tim Yandel (Tulane) to make it 4-2, before Spano himself scored on a single by Johnny Cole (Coastal Carolina) to cut the deficit to 4-3. The T-Bolts scored another run in the bottom of the fourth, and Will Resnik (High Point) would come in to relieve starter Riley Stephenson (UMBC). Resnik would go on to pitch 5.1 innings, giving up no runs on just two hits and a walk while striking out four. After three innings dominated by pitching, the Big Train cut into the T-Bolts lead in the top of the eighth, scoring another run. Spano once again came up in the clutch for Bethesda, hitting an RBI single to center field to score France, making the score 5-4. Resnik would throw a shutout inning in the bottom of the eighth, giving the Big Train one last chance to tie things up. The offense answered in the top of the ninth. With one out, Kyle Wernicki (Virginia Tech) reached first base after being hit by a pitch. He advanced to second on a wild pitch, and came in to score on a two-out single by Kevin Tatum (Cornell). That tied the game at five. After a walk by France, Yandel came up with an RBI double to score pinch runner Harrison Bruce (San Francisco) and give the Big Train their first lead of the game. The slim lead would be enough for Resnik to close things out in the ninth, as he retired the side in short order to secure the 6-5 victory. The Big Train have an off-day on Thursday before traveling to Baltimore on Friday to take on the Redbirds. 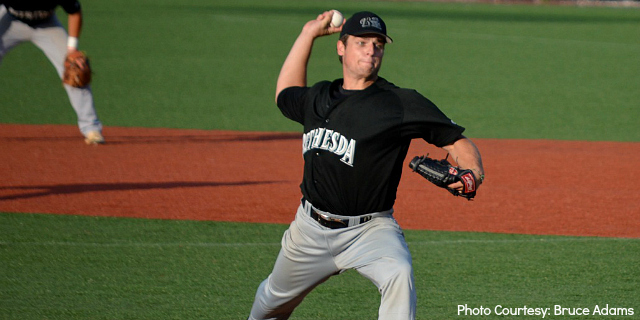 Bethesda then travels to Glen Burnie on Saturday to take on the Youse's Orioles before returning to Povich Field on Sunday for the Fan Appreciation Night doubleheader against the Alexandria Aces. In honor of our great fans, everyone will receive a Big Train fan to help keep them cool. Tickets can be purchased here or at the gate. WINSTON-SALEM, N.C. – The Bowie State University football team has been predicted to finish 6th in the CIAA and 3rd in the Northern Division according to the 2013 conference preseason poll, which was released during the league's football press conference at the Reaves Center on the Winston-Salem State University campus. The Bulldogs return 39 lettermen including 16 starters from last year's squad. Bowie State finished the 2012 campaign with a 5-5 overall record and 2-5 record in the CIAA. Senior defensive tackle Oladimeji (5-11, 240, Washington, D.C.), junior tight end Khari Lee (6-4, 235, Baltimore, Md. ), fellow junior center Austin Hochman (6-5, 284, Annapolis, Md.) and sophomore defensive back Curtis Pumphrey (5-8, 155, Laurel, Md.) were selected to the 2013 All-CIAA Preseason Team. The conference Predicted Order of Finish and Preseason Team are voted on by the CIAA Football Coaches Association. The defending CIAA Champions of Winston-Salem State University were selected to finish as the top team in the conference in 2013 followed by Elizabeth City State University, St. Augustine’s University, Chowan University and Shaw University made up the top five teams. Bowie State was voted as the sixth overall ranked team in the conference followed by Johnson C. Smith University, Virginia Union University, Fayetteville State University, Virginia State University, Livingstone College and Lincoln (Pa.). Bowie State will open up the season on September 7th, making a non-conference road trip to Manchester, N.H. to face the St. Anselm College Hawks at 1 pm. St. Anselm is a member of the Northeast-10 Conference and finished the 2012 season with an overall record of 2-9 (1-7 in the conference). 60 David Gatlin ECSU SR 6’4 330 Washington, D.C.
41 Oladimeji Layeni BSU SR 5’11 250 Washington, D.C.
1 Nigel Rios ECSU SR 5’9 170 Washington, D.C.
Big Train Home Game Tonight! 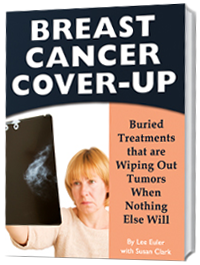 Did a Leading Cancer Doctor Really Admit This?